This is a really big deal for me. When my son was diagnosed with multiple food allergies, it really impacted how we go about in our everyday lives. Even going out to eat was like walking through a minefield; we have to scrutinize each item in the menu and even then, there's always a chance of cross-contamination and a possible allergic reaction. Over the years, we've been lucky enough to safely dine in a few eating establishments but there are still places I wish we could go but I know we just can't. Which brings me to the pancakes. I can't just take him to the local pancake house and order a stack of pancakes. And because of that I guess I've made it a point to at least make him the best tasting pancakes at home. In the whole scheme of things, it may seem very trivial, but to me, and I'm sure for a lot of people with food allergies, little treasures like these bring our lives back to almost normal. Oh by the way, on my last post, I mentioned that I was able to take this egg-free pancake recipe and turn it into egg-free funnel cakes. I did try it with ice cream and they were soooooo good! 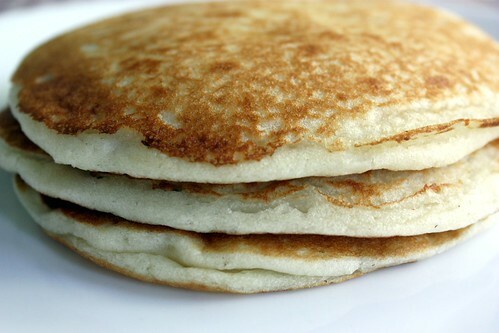 *For vegan pancakes: Instead of milk, you can use soy milk, rice milk, almond milk or fruit juice. Instead of melted butter, you can use vegetable oil, dairy-free margarine, applesauce, coconut oil (melted) or vegetable shortening(melted). Sift together flour, baking powder, sugar, and salt. In a separate bowl, whisk together milk, oil and orange juice. Slowly add in the melted butter. Combine with the dry ingredients. Pour about 1/2 cup of batter onto a hot nonstick pan. (This batter tends to bubble up and thicken due to the baking powder. You can gently stir it to break down some of the bubbles to bring it back to a pourable consistency.) Cook until you see a few bubbles rise to the surface and it's dry around the edges, then flip over to cook the other side until lightly browned. Serve with butter and maple syrup or whipped cream and fresh fruit. Thank you for this recipe, i have been searching for eggless pancakes recipe from long time...thanks a ton! Fantastic!! Egg free pancakes and with orange juice sound so so good!! These look delicious. I wonder if the orange flavor comes through from the orange juice? We love orange flavor so we're looking forward to trying these. Thanks! so what makes them so fluffy?? :) I've been trying to find a way to make nice pancakes that don't have eggs in them for my 3yo little boy! :) I tried the "No Egg" from Orgran but they just taste yucky and stick to the pan. So I'll have to give these a go! I tried a bit of cream cheese in the last batch which did help with the flavour a bit and they were slightly less sticky too. We really love your recipe for chocolate chip cookies with cream cheese - the most totally amazing egg-free cookies ever!!! Thanks so much for sharing - I love your blog! I even turned them into jam thumb-print cookies last week and they were very delicious! This is a FANTASTIC recipe - especially with the addition of 1 mashed banana (put it in at the end, after the butter and whisk through). Made these for my daughter today and they are soooo delicious thank you very much!! My daughter is allergic to wheat, dairy, eggs, and soy. I followed the recipe, but used almond milk, soy free, dairy free margarine, and gluten free flour and they turned out fantastic! I think I may even like them more than regular pancakes. This was SOOOOO helpful. Just that knowledge of bakingpowder and orange juice will help SOOO much with baking and fried breads. I have a 3 year old with egg, milk, and nut allergies. Cooking is a challenge, but I have learned a lot over the past couple years. I am making your pancakes right now at 11pm so we can take all the kids to grandma's for breakfast tomorrow and my allergy kid can enjoy them too. I substituted milk for soy milk and since I didn't have orange juice on hand I used 4 teaspoons of vinegar. I was a little worried, but tasted the first one and you couldn't taste the vinegar, but it did fluff up. Soy milk is the worst at making thick cake pancakes, but this has done a lot. I will have to keep playing with it and try the orange juice as well. THANKS! i subbed all veg. oil instead of the melted butter,(son with a milk allergy) and didnt have milk free butter... still awesome!! I'd like to bookmark this website. Thank you. do u know if you can sub. the orange juice for any kind of juice\?? Thanks SO much! My son LOVES them! We added chocolate chips! I just found your blog yesterday and I'm so glad I did! We found out last weeke that our son is allergic to egg and we already knew he was allergic to peanuts. I needed a pancake recipe and yours was a hit! We loved them. I have written a post on my site and included a link to yours. Thanks so much for sharing! I have book marked your blog and am excited to use many more of your recipes! thank you very much for all your egg-free recipes!! Thank you so much for this recipe. My son is 15 and last night had his first ever pancake. This recipe is amaaaaaaaazing! Thanks for this recipe, my egg allergic son was delighted with the pancakes...he feels left out so often when there are cakes etc. being served so I'll be checking out your other recipies. these pancakes came out just perfect..they were awesome!!! 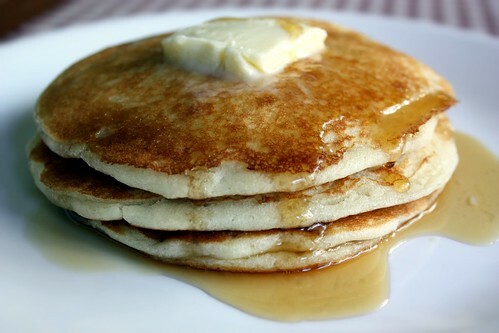 i made these pancakes & they were perfect... my husband & kiddo both loved them... thanx a ton! used buttermilk instead of regular milk and they were amazing!! Had to add a bit more than 2 cups though. Can't wait to try again! I just made a half batch of these with cut up banana and chocolate chips...used orange-peach-mango juice and they turned out fantastic! Half batch made about a dozen pancakes, 3 inches in diameter of fluffy deliciousness. Thanks so much for this amazing recipe and so many others!! I made these today for my egg allergic daughter and they were so much better than "normal" pancakes! :) The only change we made was to use coconut oil instead of veg oil. Very yummy. We don't have egg allergies here, but my 11 yo "Pancake Connoisseurs" wanted pancakes for breakfast this morning & I was totally out of eggs. She absolutely LOVED these! (When I told her they had OJ in them, she said, "Huh, yeah, I can taste it a little, but it's REALLY good!" A few of her best friends do have severe food allergies, so I'm sure I'll be returning to your blog many times! having a pancake breakfast tomorrow and keen to have a go at these. How wuld it go using gluten free flour? Thank you so much for this recipe! My son is allergic to eggs, and this is truly the most delicious egg-free recipe I have tried. We added wild blueberries and Ghiradelli semi-sweet chocolate chips. The kids gobbled them up! I didn't have orange juice, but I used apple juice instead and it came out great! Delicious! I substituted plain flour for self raising, and Orange juice for water and one tsp vinegar. Definitely one for the printer! Thanks! I have not been disappointed by any of your recipes yet! My son has an egg allergy, and it's been a struggle finding delicious egg-free baking recipes. If you compiled a cookbook, I would buy one for every family member who has doubted that egg-free baking can occur and be yummy. Until then, I thankfully, joyfully print out recipes. Thank You, Thank You!! Thanks so much for this recipe! My son has severe allergies and I had to modify this even more by using almond milk, all canola oil, brown rice flour, and baking soda since I've not been able to find a corn free baking powder yet. I also added frozen blueberries and cinnamon- they were fantastic! Even my husband liked them which says a lot :) I look forward to browsing the rest of your recipes. Thanks again! Amazing! Didn't get quite as fluffy as the pic, mine were more crepe-like, but I used skim milk. But I made for someone with adult on-set egg allergy who hadn't had pancakes in years and he was thrilled! Couldn't believe there was no egg! Thanks!!!! Great recipe! Thank you from my egg allergy daughter!! Ever thought of going Paleo? I hear a lot of stories that people lose their allergies after going Paleo. My allergy for hazelnuts, apples, etc. is completely gone. We just made this and it's wonderful. My daughter and I have milk and egg allergies and it was great to finally find a reciepe that works. I used too much rice milk and I took out the juice but it worked in the end. I'm going to make them again next weekend. Perhaps I am being stupid..but... Mix the flour etc..then in a seperate bowl oil,milk etc. Add melted butter to which bowl? You go straight onto pouring batter into a pan. Is everything in one bowl or not??? How do you intorduce the ingredients??? Confused by red wine !! This is, by far, the best egg-free pancake recipe we've tried--no tweaking required to make it better! Perfect just as-is. Thank you so much! Thank you!!! Finally a recipe that doesn't compromise taste. I love them. Highly recommended. Thank-you, thank-you, thank-you, thank-you SOOOO much. My daughter is allergic to egg milk and whole heap of other things. I have a recipe for flat thin pancakes but we do exhaust eating that over and over again, this was lovely have american pancakes..they came out really nice and everyone came down for some. I cannot thank-you enough for uploading this and making a part of our difficult food life become somewhat delicious. They are awesome and i have been making egg free dairy free cakes muffins pancakes for 4 yrs - this is the best recipe so far. These pancakes were amazing!! I have a 1yr old with egg allergy. I did tweak them a little as I did not have all the ingredients on hand. I used fresh squeezed lemon juice instead of orange. I replaced veg. oil with coconut oil. So they had a tropical taste to them. Then I juiced a pineapple and made a syrup out of it...my kids devoured them! Will use this recipe all the time. Way better then traditional pancakes. I made this just now with coconut milk instead of milk, substituted 1/2 cup of quinoa flour for some of the all-purpose flour, and added in some cut up chunks of endangered species natural dark chocolate ... delicious! a HUGE hit in our house. thank you. I never comment , seriously never.....but omg these were so good. Seriously they exceeded my expectations. I love love love the texture! We added chocolate chips because i had ran out of maple syrup and they tasted like chocolate chip cookies. Thank you so much for taking the time to figure out how to make egg free recipes taste delicious!! We have made this recipe multiple times... It is the best recipe we have tried... My parents didn't even know they weren't "typical" pancakes!! More importantly, my son loves them (egg allergy)! My kids love these pancakes! Especially my daughter...and she isn't even the one with the egg allergy (my son is allergic to eggs)! I don't usually have OJ in the house so I substitute whatever we have on hand...usually the Capri Sun Super V fruit/veggie juice blend. This is our new go-to pancake recipe. Thanks so much for your wonderful recipes, these pancakes and your egg-free waffles are a regular feature in our house and we love them! My daughter who has an egg allergy just loves them and I shared your blog with the director of her day care centre and now these are a regular feature on the menu at daycare which is an egg and nut free zone. Again, thank you so much for sharing your wonderful recipes! We love these pancakes!!! The first time I made them I didn't have vegetable oil so I just left it out and they were great!! Decided to try with the vegetable oil and found they were rather thin, yet still yummy. Maybe the humidity is a factor since we live in a humid area? Thanks for sharing this recipe! !